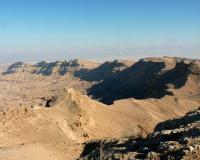 Makhteshim Country is part of the Tentative list of Israel in order to qualify for inclusion in the World Heritage List. We visited 3 of Israel’s 5 “Makhteshim” (out of 7 in the World according to Wiki with the others in Sinai.). They are certainly intriguing geological phenemona and at times even approach “impressive”. Although often called “Craters”, they are the result of erosion processes rather than impact and are claimed by Israel to be a geological formation unique to the Negev. Little Makhtesh (Katan) and Big Makhtesh (Gadol) are close to each other and easily accessible when visiting Mamshit – just take Route 206 south from there. The first reached is Katan. This is signed along route 227. The last couple of kms are gravel (ok even for our very small rent-a-car) and then you need to park (signed) and walk the last kilometer or so to reach the overlook. We found this to be the most impressive of the makhtesh as, being the smallest, its sides are relatively close and it has an almost circular shape (Photo). You will then pass through Gadol if you make for the town of Yeruham along route 225. The cliff sides are visible but, unlike those of Katan, they do not give the impression of being part of a single structure. As you drive through you will pass an area of “Coloured sands” with picnic tables etc and loads of rubbish! We found the “banding” of the sands very disturbed by visitors and rather disappointing – distant views of other formations from the top of Katan were better. Slightly more interesting a few kms further towards Yeruham, is an area of Petrified tree trunks (You need to look for a sign saying “Quartz Arenite” – they is around 200 metres off the road!!). Makhtesh Ramon is the largest and furthest south – it is best combined with a visit to Avdat and Shivta but really involves a significant additional deliberate drive south if you want to see it as well. You will reach the town of Mitspe Ramon, beyond which Highway 40 immediately plunges steeply down the side of the makhtesh. At the bottom there are trails and examples of various geological formations/rocks/sands but you also need to allow time to view the makhtesh from the top of the cliff and, for this purpose the Israeli National Parks have built a striking Visitor Centre to the right of highway 40 going south. There is no need to pay to go into the centre if you don’t have time or don’t fancy its offering – there are very fine views from a crater edge pathway which is accessible from the Visitor centre car park without entering it. Whilst it was clearly rather new, I have discovered only on our return that it didn’t open until 2013. It costs 29 NIS to see a couple of audio visuals (only one of which is about the Makhtesh) and an explanatory exhibit about the geology of the area. Rather strangely, the first of the 2 AVs is about the Israeli astronaut Ilan Ramon who died when the Shuttle Columbia disintegrated in 2003 and it is preceded by a visit to a small exhibition room about him/his mission. Apparently, when he joined the Israeli air-force, Ilan changed his family name from Wolferman (his family escaped from Germany/Poland) to Ramon because of his love for the Negev. Now, every country needs/has its heroes and the AV/exhibition is a nice way for Israel to honour one of its own – but whether, as a non-Israeli, you want to pay 29NIS for it you will have to decide. The other AV and the geology exhibit were “missable” in my view, but we had a prepaid pass so the issue didn’t arise. I should mention however that the Ilan Ramon AV does finish with a rather fine “coup de theatre” which I won’t spoil by describing it - though it does involve the makhtesh! Currently the history of this nomination as recorded on this web site isn’t correct/complete as it has in fact been put forward twice by Israel – not once. It was first nominated for the 2001 WHC under criteria i and iii. This is the IUCN evaluation for that - http://whc.unesco.org/archive/2001/whc-01-conf205-inf5e.pdf . IUCN wouldn’t accept the natural criteria and didn’t like various aspects of managmement, mining and boundaries, but it was decided to “Defer” in order for Israel to consider making a “mixed” nomination to include cultural values within the area which ICOMOS had indicated could be present. Israel then submitted a revised and extended (to include Mt Sdom and Arava Valley) nomination for consideration at the 2005 WHC under Criteria i, iii and iv but, before this was done it removed all but the geological basis of criterion i. In the mean time it was pursuing a separate cultural nomination for the Incense Route of the Negev rather than going for a “mixed” nomination with the Makhtesh (and was of course successful in doing so in 2005). Despite various other changes made which IUCN agreed included improved management etc IUCN STILL only regarded “Makhtesh” as an “oddity” in Geological terms (A specialized example of an “Anticlinal erosion summit valley” which are apparently very “common”) and therefore without OUV. See its evaluation here - http://whc.unesco.org/archive/2005/whc05-29com-inf08B2e.pdf Israel again withdrew it before a formal rejection so it could come back in again but it would seem that it has probably reached the end of the road on this one!